In an economic depression, weird and eerie things transform into the new normals. Zombies — banks which should have been dead and buried long ago — continue straggling and threatening to pull the world economy into the grave. Madmen — fund managers always in search of abnormal returns — keep switching huge amount of funds between investment assets, only to discover that normal now means negative returns while abnormal means bigger negative returns. Steve Jobs was famous not only for his creativity but also of prevailing upon his team members that the unreal could be real. He distorted reality to bend people to his will but you cannot fault him because he delivered what he had boastfully promised. This reality distortion feat has also become the new normal, none more obvious than the supposed recovery in the US housing market at a time when prices should be dropping with the ebbing credit quantity. Housing or real estate is one economic sector that has generated a distorting effect on the true direction of the economy. Because house prices will always climb to stratospheric heights just preceding an economic depression, post-crisis house price drops exceeding more than 50% are typical. It's easy to see why house prices steeply climb in the first place. In the mad search for abnormal returns, housing is the last bastion offering such returns primarily because it's sheltered from foreign competition. Furthermore, most buyers steadfastly hold on to the view that land and buildings, like precious metals, are assets that won't depreciate in value. As a Mark Twain quote oft-used by real estate agents has it, "Buy land, they're not making it anymore." Events over the last four years have disproved that belief. Many countries were hard hit, especially those that had relied on real estate to drive their GDPs (see The Economist chart at left). 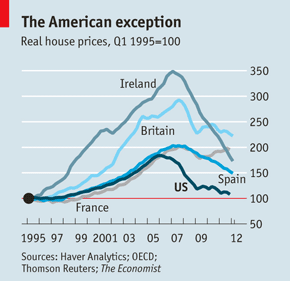 In the US, house prices climbed 83% from 1997 to 2006. However, among countries that had property booms, the US property boom was relatively mild. That doesn't mean that the price correction will be more subdued than those experienced by other countries. So far, only Ireland appears to be the hardest hit. But Spain, with the most overbuilt homes in Europe — 675,000 homes built annually between 1997 and 2006 — has seen prices dropping by 32.4% from their peak in December 2007 to the end of 2nd quarter 2012. With more than 2 million unsold homes and housing debts in the balance, housing price drops will continue to bedevil the Spanish economy. 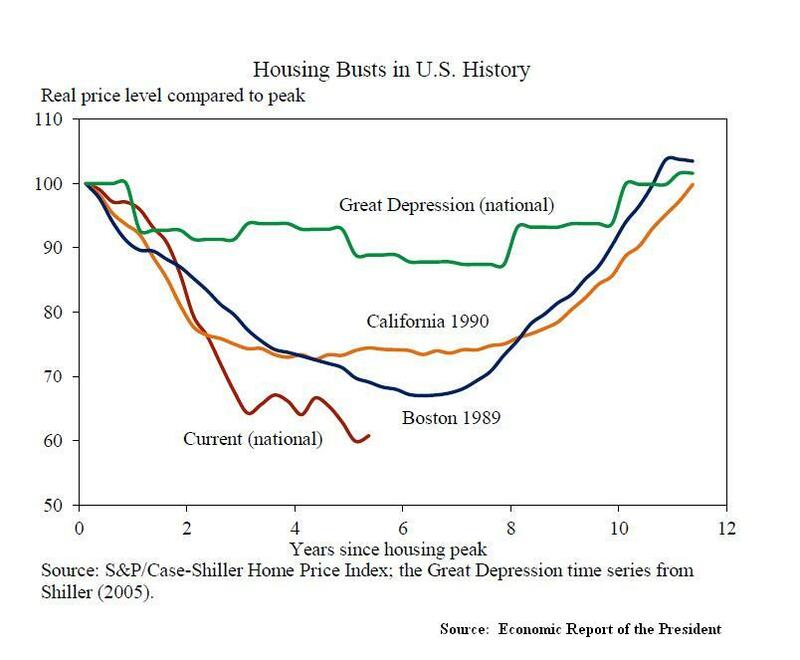 As for the US, the chart at left from the 2012 Economic Report of the President, shows that the current housing bust is worse than that of the 1930s Great Depression. 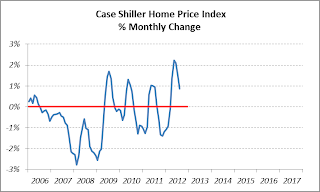 Even the Case-Shiller index is not above distorting the numbers as any depression related declines would usually exceed 50% of the housing peak values. 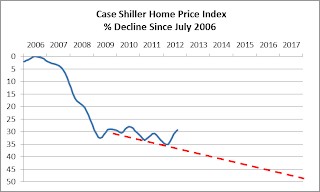 The nominal price drop from 1925 to 1933 as registered by the Case-Shiller index was 30.4% but because the economy was also suffering from deflating prices, the real drop was 12.6%. Both numbers don't seem plausible given the drastic plunge in credit quantity then. One finance blog argues that the Case-Shiller home prices during the Great Depression are not actual sales data, but hypothesised. In fact, a study of home prices in Manhattan during the Great Depression found that prices dropped by 67%. This big drop is more credible given the features of the mortgage at that time. Back then all mortgages were of short duration, from 5 to 10 years. A mortgage required a down-payment of one-third of the purchase price. Interest was paid every 6 months while the principal was paid in one lump sum, known as the balloon payment, at the end of the loan period. Usually instead of the balloon payment, the mortgage was rolled over into a new one at the prevailing interest rate. The banks also had a call provision inserted into the mortgage, so that they could at any time demand immediate payment. A severe credit crunch caused the banks to trigger that provision in the depths of the Great Depression, fostering the sharp descent in home prices. To counter the lack of financing facilities, President Roosevelt, as part of his New Deal, created the Home Owners' Loan Corporation in 1933 to provide financing that stretched to 25 years. Another agency, the Federal Housing Administration, was set up the following year to guarantee loans made by the private sector for up to 30 years. That was how the present mortgage loans came to being. It doesn't mean that the new type of mortgage financing is resilient to any credit crisis. What it means is that instead of a sharp, sudden credit shock, you now get a long-drawn-out credit crisis that continues to hang in mid-air. Instead of a heart attack or a stroke, we now get cancer. The final outcome never differs. 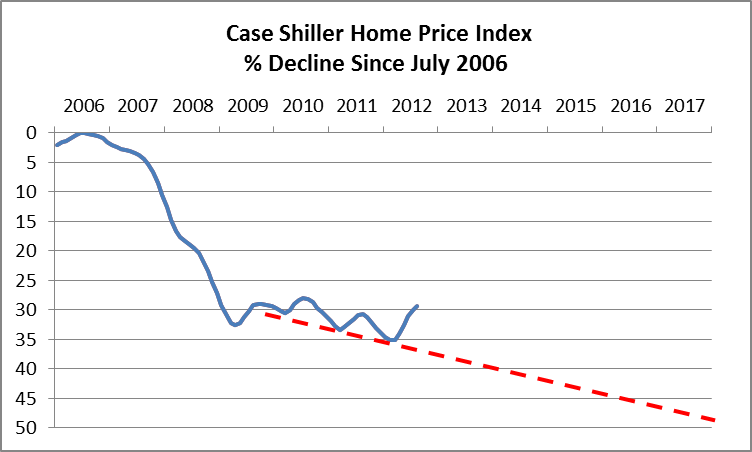 Let's review the current Case-Shiller index (chart at left). I've drawn the vertical axis in such a way that tracks the % decline since the index's peak in July 2006. My target for the eventual bottom is a 50% drop from the peak. This is done by extending a red projection line linking the past troughs all the way to the 50% mark. At the rate the index is snaking, it's expected to reach the 50% mark only by the end of 2017. That's still a long, long way before we see any sign of a real recovery. However with the impending cutbacks in federal deficits, we can be certain that Obama will accelerate the process somewhat. What about the latest apparent recovery in the housing market with the uptick in the number of housing starts and home prices? Look carefully at the chart above. The curve is about to reach its peak and turn the corner for the worse. 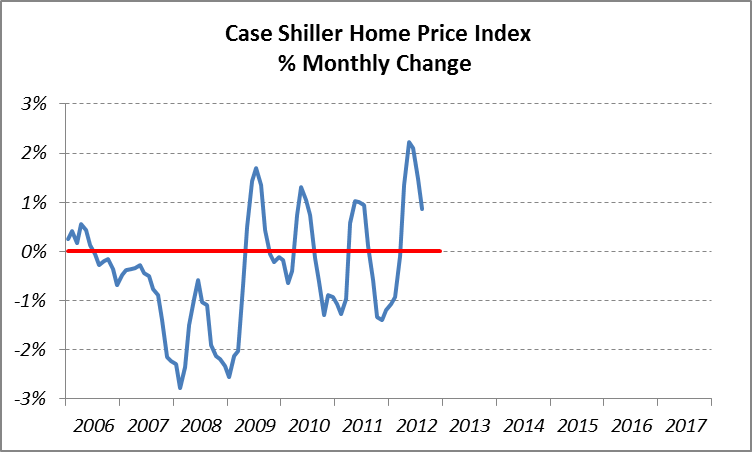 If you're still skeptical, see another chart at left, this time depicting the month-to-month change in home prices. Now the pattern is as clear as crystal. In every single year since 2008, we have had a dead cat bounce. In normal times, it is said that a cat has nine lives. But in times of depression, even a dead cat has nine lives. The last presidential election should have been Romney's for the taking given the state of the economy. But alas, the economy was in a minor bull market as seen on the chart above. Give another two months and you'll see Obama's ratings dropping precipitously. About the Mark Twain quote that I mentioned earlier, there's a need to shed some light on Mark Twain, the person. Mark Twain was well-known for peppering his writings and quotes with satire. He lost a large share of his book profits, about $150,000 or $4 million in today's dollars, not on land deals but on the Paige Compositor, an automatic typesetting machine. I guess it would be amiss if I didn't include this quote of his: "Get your facts first, and then you can distort them as you please." Well, he never said that we should buy land because the price would keep on rising.